Washington • Sens. Orrin Hatch and Mike Lee of Utah voted to advance Supreme Court nominee Brett Kavanaugh to the full Senate on Friday as another GOP colleague, Jeff Flake of Arizona, successfully pushed for a one-week delay before a final vote while the FBI investigates allegations of sexual misconduct. Senate leaders agreed to Flake’s demand and asked President Donald Trump to initiate the FBI probe into accusations of three women who say Kavanaugh either assaulted them or acted inappropriately. Kavanaugh, a federal circuit court judge, has denied the allegations. Kavanaugh, meanwhile, said he’s been an open book and will continue to be. "The supplemental FBI background investigation would be limited to current credible allegations against the nominee and must be completed no later than one week from today,” the Judiciary Committee said in a statement. The GOP-led committee split squarely along partisan lines, 11-10, to forward Kavanaugh’s name toward confirmation, though Flake’s last-minute deal struck with Democrats means that the Supreme Court will start its new session Monday with just eight justices. Hatch, a former Judiciary Committee chairman who has defended Kavanaugh, strongly condemned a delay during a morning hearing before Flake — who says he’ll support the nominee — argued for a short wait. 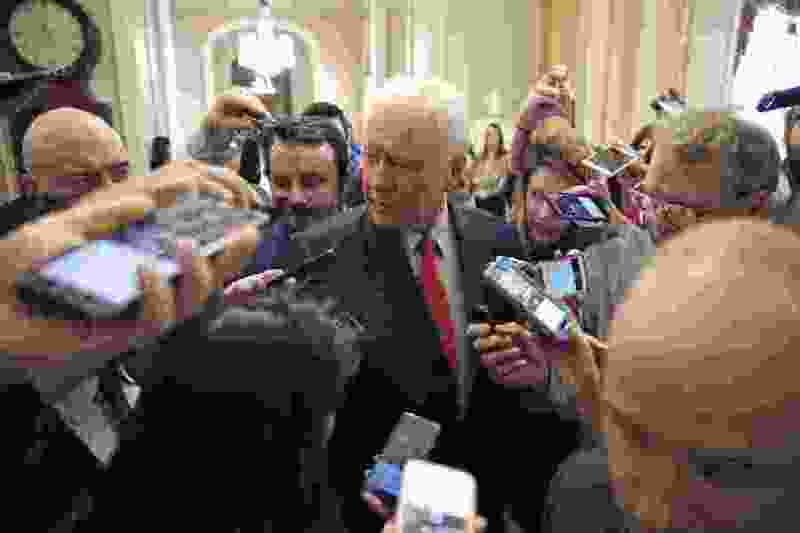 Hatch has said that he believes Kavanaugh over the accusers, including Christine Blasey Ford, who testified before the committee Thursday. Hatch later said he backed the short delay, even though he'd like to vote sooner. Lee, who also sits on the Judiciary Committee, said an FBI investigation would have been appropriate if it were launched as soon as Democrats knew there was an allegation of wrongdoing. Sen. Dianne Feinstein, D-Calif., received a letter in July from Ford, a California research psychologist who alleges Kavanaugh pinned her down and groped her during a high school party when they were both teenagers. Ford requested anonymity. Lee later said in a statement that he would support an FBI probe since some of his colleagues want one. Hatch and Lee had both said they found Ford's testimony Thursday compelling but that they didn't find enough evidence to prove Kavanaugh had been the one who assaulted Ford. If Kavanaugh is confirmed, he would replace retired Associate Justice Anthony Kennedy and likely shift the court to the right. Republicans hold 51 seats in the Senate and can afford to lose one member and still confirm Kavanaugh if Vice President Mike Pence casts a tie-breaking vote. With the exception of a few Democrats from red states, who haven’t said how they’ll vote yet, the minority party is lockstep in opposition to Kavanaugh’s nomination. After Thursday’s exchange with an emotional Ford testifying about the alleged incident and Kavanaugh offering a fiery rebuttal, Sen. Patrick Leahy, D-Vt., said the Senate should reject his nomination. “I listened closely to both her and Judge Kavanaugh. And I believe her,” Leahy said.